Earth Day is a day to celebrate our Earth and to take a stand against things like pollution that are poisoning our planet. 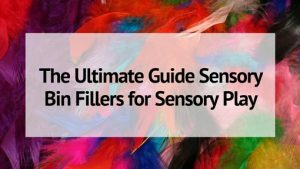 And while Earth Day is not about arts and crafts, kids learn best with their senses. Young kids don’t understand their place in the world yet and they certainly don’t understand the Earth’s place in the solar system! 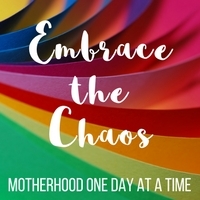 So by doing Earth Day crafts, you can open up the lines of communication with your young kids. Discuss the Earth. What is looks like. It’s geography. And how people impact the Earth in both positive and negative ways. The following Earth Day collage project is simple. Simple enough for toddlers, yet engaging enough for older kids. And it looks great hanging in a sunny window! 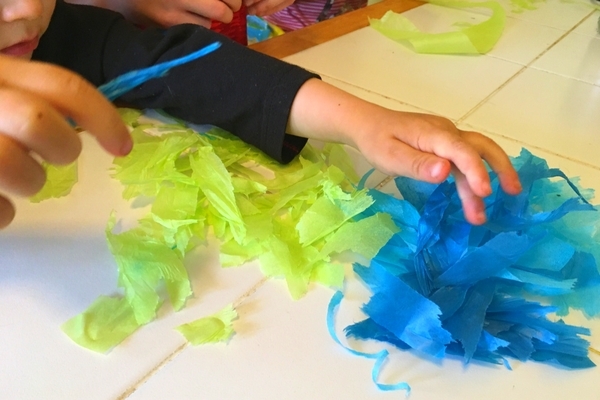 You’ll want to start by tearing strips of blue and green tissue paper. Then let the kids tear them into small pieces. 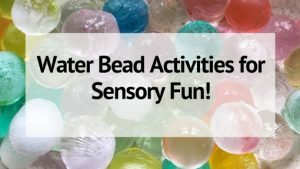 This is a great fine motor activity for young kids! I had 5 kids ranging from 2 years to 14 year old doing this project along with me and they all tore paper in different ways! Once you have a good sized pile of both colors it’s time to start creating. One of my favorite things about this project is that it’s glue-free. 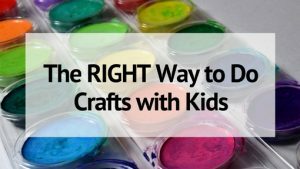 Collages always look great but getting kids, especially young ones, to use the correct amount of glue and not too much can be frustrating and messy! Cut a section of contact paper- my roll was about 12 inches long and I cut approximately a 10 inch length. Carefully peel off the backing and place your contact paper piece sticky-side up on the table. 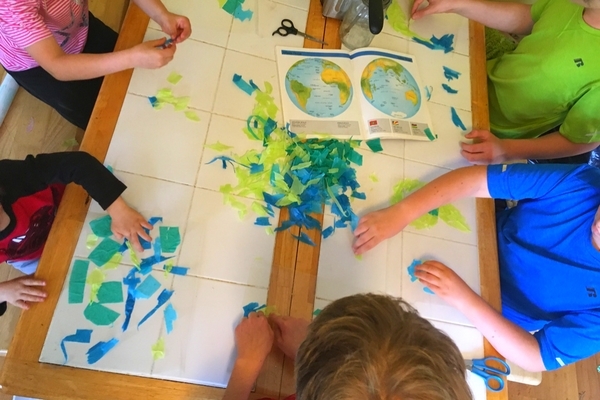 If you have a printed outline of the Earth, place that behind the contact paper so the kids can see where to put green (land) and blue (water). Or get out an atlas with a picture of the Earth and let them try and copy. Once all of the space has been filled and the earth collage is complete, cut a second, similar sized, piece of contact paper. Peel off the paper backing and place this second piece sticky side down on top of your collage. This will sandwich the collage inside. Smooth it out really well to remove and wrinkles or air pockets. 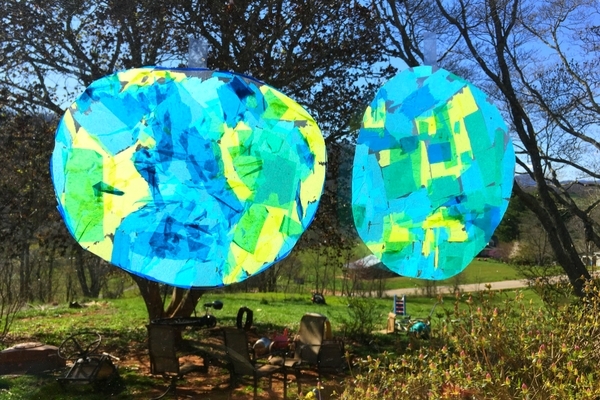 Grab a pair of scissors and cut your collage into an Earth-shaped circle. Older kids can do this free hand, younger may need an outline drawn, and toddler will need you to do this step for them. 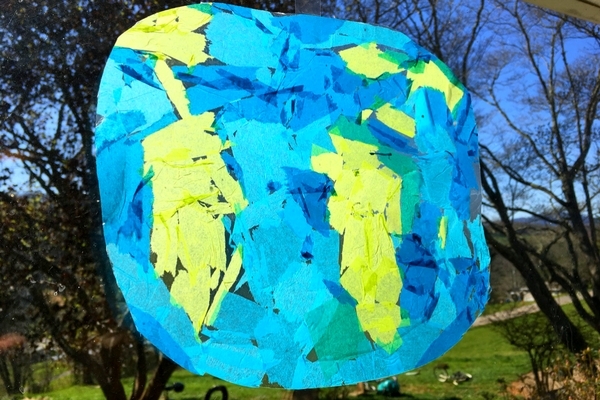 If you are looking for another planet craft- try making a marbled planet Earth with my Marbled Planets Craft! Then tape them in a sunny window to enjoy! And don’t forget to discuss the Earth and Earth Day as you complete the project together!